The retrofitting of the “Schulberg” in Wiesbaden (Germany) creates a new extraordinary public space. The playground's outstanding architectural design, overlooking the city centre of Wiesbaden, is attracting people of all ages and ethnical backgrounds to meet and communicate through the action of play. The heart of the new public space is constituted by an artistically and ambitiously shaped playground consisting of a large spatial structure. Together with the adjacent reconstructed Kunsthaus (museum and artist‘s studios), the monument of the former Synagogue and the restored Romertor (a Roman aqueduct from the 3rd century) the Schulberg can be seen as a catalyst in this previously neglected area. Because of its exceptional and sculptural design the new playground is on one hand highlighting the urban importance of the site overlooking historic Wiesbaden and on the other hand offering an attractive and complex range of gaming activities. 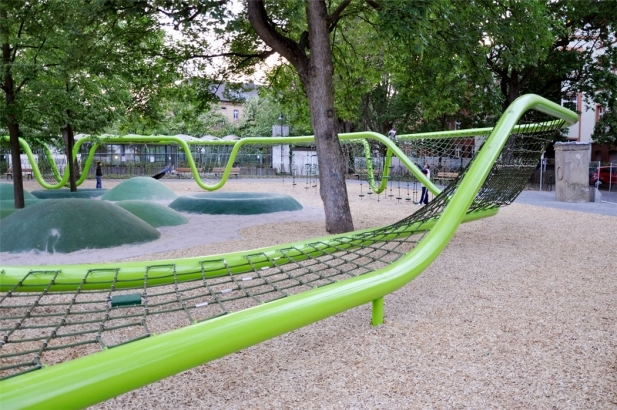 Three main elements define the playground: The main element is a spatial sculpture consisting of two green steel pipes winding and floating in between inventory trees, levelling in distance and height. In between this structure, a tensed climbing net is creating a loop – a continuous sequence of gaming activities for children and teens. The pentagonal shape of the structure is inspired by the historic shape of the city of Wiesbaden, while the up and downs of the pipes are referring to urban situations on site, generating entrance situations or overlooking points. The entire sculpture is 35m (115feet) in diameter. The inner ring holds a length of 107m and the outer ring a length of 120m. In some places the steel construction is cantilevering up to impressively 15 m. The structure does not ex- ceed the height of 3 m to fulfil the safety regimentations for playground designs. Within the loop there are six main stopovers for playing activities: in a liane garden the kids can climb up and down or swing in between lianes with different levels of difficulty. Rubber granulate plates, partially rotating, are supporting the climbing or simply offering a resting platform. In the lowest part of the structure, those rubber plates allow the user to pass over the net by jumping from plate to plate. Further stopovers in the parkour are i.e. bouncing membranes, a tunnel, a nest swing, a sliding membrane and a steep climbing wall. The bright attracting green colour of the sculpture is corresponding with the trees on site and the adjacent reddish brick buildings. The second element of the playground is constituted by a modelled topography being enclosed by the climbing sculpture. Small hills and rings, made from green soft rubber granulate, surrounded by sand, frame inventory trees and offer playing facilities for younger children – or alternatively provide meeting or resting spaces for teens and parents. A third element of the design is a boulevard constituted by a wide pathway around the playground providing benches for parents and the elderly who come to watch their children play or enjoy the stunning outlook over Wiesbaden. An anthracite, elegantly rounded curb follows the pentagonal shape of the playground and separates the playground from this boule.